Download the Spring Term’s Curriculum Newsletter here. This is based on a verbal behaviour model and focuses on listening skills such as following vocal directions and speaking skills such as asking for items, labelling and responding to questions. Pupils can work through the same targets with sign or pictures to aid their communication skills. 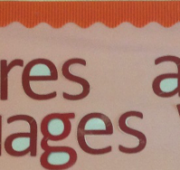 This category includes all academic skills linked to an Early Years and Key Stage 1 curriculum eg. maths, reading and writing, sorting items into categories and learning about opposites. This involves expanding each pupil’s interests and preferences, eg. playing with toys independently and choosing to look at books during free time. This category focuses on skills that a pupil needs to be independent in school, such as toileting, eating and dressing independently and following the classroom rules. 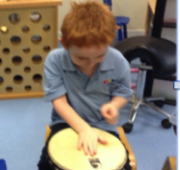 It also focuses on social skills such as playing alongside others, turn-taking and sharing. This includes the fine motor skills that are important for school, such as holding and using scissors, and also gross motor skills, such as throwing a ball and jumping. An individualized curriculum is then formulated to best respond to each child’s needs and goals. Jigsaw is committed to working closely and in harmony with its community and celebrating the diversity of the United Kingdom. We aim to prepare our pupils for life in modern Britain and to ensure that our school ethos, curriculum and approaches to teaching and learning reflect and promote fundamental British values. We recognise that these values are not unique to Britain alone and that they have come to be accepted throughout the democratic world as a method of creating an orderly society, in which individual members can feel safe, valued and can contribute to for the good of themselves and others. We work alongside our local community and recognise the variety of religious beliefs within it. We take pupils outside the school to take part in local events and meet different members of the community to appreciate the valuable contributions they make. ♦ acknowledge, celebrate and commemorate national events and anniversaries related to key events in Britain’s past. We understand the role our school has in helping prevent radicalisation and extremism and supporting our pupils to become life-long learners. Many of our school routines are built upon the concept of democracy. Pupils are regularly consulted both formally and informally about how their school might be improved. They see the example that is set with staff working cooperatively & collaboratively with each other to make the school the best it can be. Pupils learn about democratic processes through involvement in the School Council, mock elections, lessons on British parliamentary system, choosing class and school reinforcers and activities, voting for their nominated charity of the year. Pupils work collaboratively to draw up school and class rules. The school’s behaviour policy is shared and understood and this provides a basis on which other laws and rules and their application is discussed. Behaviour management strategies reinforce appropriate behaviours and promote understanding of right and wrong. Pupils are involved in drawing up school and class rules. Data protection, online safety code of conduct are discussed with pupils and promoted cross curricular. Regular visits from police, fire services and other members of public institutions are incorporated into curriculum. Teaching promotes understanding & recognition of individual’s rights and responsibilities with learning about boundaries. Independent thinking and learning are encouraged and there are frequent opportunities to grow in maturity and independence. We value creativity and diversity. Pupils are encouraged to participate in setting up their schedules and timetables for the day. They can select reinforcers, rewards as well as resources to be used during instruction. 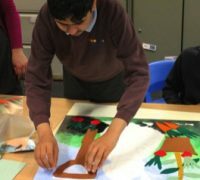 The curriculum incorporates objectives to promote independence and pupils are encouraged to be involved in managing their own learning and behaviours. History and other themed weeks provide opportunities to learn about individuals who had a particular impact on the history of Britain and the world at large. We have a clear anti-bullying policy which emphasises the importance of creating an environment in which individuals can feels safe and valued. We recognise the importance of not only respecting one another but also of self-respect. Every individual is respected in our school and our actions towards one another reflect this. We welcome difference and diversity and aim to create understanding of how this adds to the richness of our community. Our PSHE curriculum includes topics on relationships and what a good relationship consists of. Our RE curriculum which follows the Agreed Syllabus for Surrey teaches about a range of faiths, religions and cultures. We take opportunities to find out about different cultures during our Cultures & Languages week and Topic curriculum. School assemblies include themes on various faiths, religious festivals & cultures. We celebrate European Languages and Mother Tongue day. To view some of the activities supporting the SMSC and British Values curriculum, please click the tabs below. This was a fantastic workshop that enabled pupils to learn about the history and culture of Ancient Greeks in an accessible, interactive way. The pupils had the opportunity to sample grapes at the beginning before moving onto to a dramatic re-enactment of the Trojan horse battle. The pupils were divided in Greeks and Trojans and had the opportunity to dress up too. Within this session there were lots of opportunities for turn taking and for different pupils to take the lead. The session leader was enthusiastic and encouraged lots of participation from the pupils. The group acting was followed by the pupils learning about the Greek’s love of theatre and took turns to wear masks that displayed different emotions in response to the host’s acting performance. The workshop finished up with an energetic group dancing session with the chance to play different instruments. The pupils had the opportunity to explore the Hans Christmas Anderson Christmas Tree field and independently choose their favourite tree alongside Jigsaw’s patron Kim Robson. This was an exciting opportunity as pupils were told that the best one would be used as the Cranleigh Village Christmas tree. We then received a tour of the rest of the farm – the highlights being a visit to the reindeers and chickens. The pupils had the chance to feed the reindeers and learn some fun facts about them. The visit finished up with some photo opportunities while holding huge reindeer antlers. On Friday 10th November Class 10 initiated our Safeguarding Week by organising Friendship Day. Class 10 pupils were helping others across the school to take part in various activities, e.g. they read books to younger pupils in the school library, went to the gym with another group of pupils, helped with the calendar activities in Class 8 and invited some pupils to the café at the end of day. Moreover, the majority of pupils took part in various activities raising awareness of safeguarding issues and cyberbullying across the week, such as assemblies, creating kindness chains where a loop was added after an act of kindness from one pupil to another. During the cyberbullying awareness day the pupils watched presentations on the topic and created digital footprints based on their internet access. Classes held assemblies in small groups where they all looked at identifying healthy and unhealthy foods and this was extended where appropriate to the different food groups, what different foods are needed for in the body and the foods that link to each food group. Classes also held challenges where they introduced a competition to see who could eat the most fruit and vegetables throughout the week and who could drink the most water. 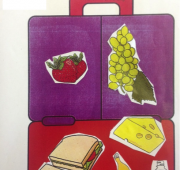 During lessons, pupils took part in further sorting activities where they created a healthy lunchbox and planed meals using the healthy eating plate. 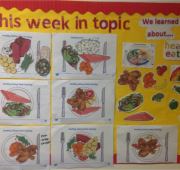 Food technology sessions were also linked to healthy eating week. During lessons pupils were encouraged to try a piece of fruit that was new to them. 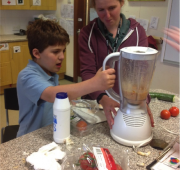 Pupils were then able to take part in an exploratory/messy food lesson (for pupils with restrictive diets) or have the opportunity to make a fruit salad or a fruit smoothie. Pupils had an opportunity to participate in decorating a wooden mask using a bowl and various coloured paints. The workshop leader showed some pictures as examples and then pupils and a go at decorating their own masks. Pupils chose the pattern and colours they wanted to use. Later, some of the classes attended drumming workshop where they copied the workshop leader. They played the drums slowly, fast, loudly and quietly. They imitated the actions and sounds of different African animals. The pupils were given the opportunity to make independent decisions in regards to taster sessions they would like to try. Three pupils chose to take part in activities at Guildford College including photography, cake decorating and rock band; whilst the other four chose to take part in activities at Guildford Spectrum including trampolining and yoga. All pupils thoroughly enjoyed their choices and also had the opportunity to meet pupils from other schools. It was a very successful day. During History Week pupils focused on the Romans. Farnham Museum visited during the week to host a Roman workshop – pupils learned all about the Romans and even got to touch Ancient Roman artefacts from over 2000 years ago! During the week pupils also got to taste different Roman food such as apricots, dates, bread and honey. Pupils also created a giant Roman mosaic using pieces of paper and their own displays within classrooms. Some pupils enjoyed listening to the story of Romulus and Remus the founders of Rome. Pupils and staff participated in various activities such as weird write-all, where pupils in one class started writing/drawing a story and then they passed it on to the next class to create a (rather strange) combined story. Pupils & staff were invited to dress up as their favourite literary characters and some pupils went to Waterstones to exchange their book tokens. On the day we also had a ‘Search for Wally’ competition around the school and pupils enjoyed reading to each other and share their favourite stories and books. During National Careers Week our pupils had the opportunity to think about life beyond school and what routes they wish to take. Pupils were shown different videos, worksheets, games & internet sites all related to careers. 8 of our pupils also attended the ‘National Apprenticeships Show’ at Sandown Park in order to look further into apprenticeships and find out about all the different things on offer. Two employees from Eagle Radio also visited to talk to the pupils about a career in radio. Three students from Surrey University came to discuss what university was like, their course and how they decided what they wanted to do. During the Safer Internet Week pupils participated in various activities to raise awareness of the issue. The topic was introduced during assemblies – pupils were divided into three groups depending on their level of verbal behaviour. The objective of the sessions was to learn how to use two ICT devices safely to play online games. Majority of the pupils used the Interactive Whiteboard and the class iPads to meet the criteria of this task. 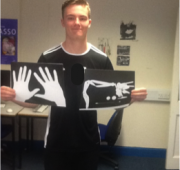 Another target was to learn about digital footprint for which pupils created their own visuals of their digital footprints and added them to their classroom E-safety displays. 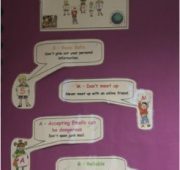 Pupils also updated their class E-safety rules and displays. “History Week” – British literary greats. As part of the Jigsaw’s summer term History Week, pupils learned about British literary greats including Beatrix Potter, Roald Dahl, William Shakespeare and Charlotte Bronte. 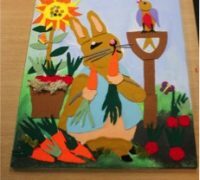 To commemorate the 150th anniversary of the birth of Beatrix Potter, pupils created a collaborative textile collage of the most loved character, Peter Rabbit. 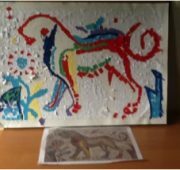 The artwork is proudly displayed in the school’s reception area – please com and take a look when you are next visiting. In November, pupils participated in engineering week by completing various activities including: a marshmallow and spaghetti tower building challenge, paper aeroplane challenge and sound engineering project recreating the sound of a steam engine using sound editing software. Some pupils also learned about careers and career routes in engineering and about the work of famous engineers such as Frank Whittle and Isambard Kingdom Brunel. 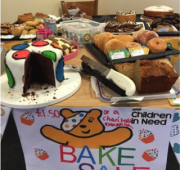 Pupils and staff participated in various sessions such as decorating cakes, making a lava lamp, playing a football match, completing an obstacle course, selling cakes and healthy snacks, and a fun talent show to raise money for Children in Need.